(Q) How can I contact support or developers? (A) Just send us a mail to info@rummyfight.se. Don't forget to include your player name in the mail. Otherwise it will be very difficult for us to help you. (Q) On what platforms are RummyFight available? (Q) Can I play opponents using the Android version if I have an iPhone and vice versa? (Q) Can I use the same player name on both Android and iOS? (Q) Where can I download RummyFight? (A) For Android you can download it from Google Play, Amazon AppStore or Appland. For iOS you can download it from App Store. The fastest shortcuts is to click on the icons at the top of this page. (Q) What are the latest released versions? (A) For Android, the latest released version is currently v1.62. For iOS it is v1.61. (Q) Are the version numbers the same on both Android and iOS? (Q) Is my password safe? (A) All passwords are encrypted already in the app and is neither sent to the server nor stored in the app's settings unencrypted. The encryption is a one way encryption which means that not even we who has created RummyFight can find out what your original password was. (Q) When is my account deleted? (A) If you are using the free version of RummyFight, your account will be deleted automatically when you haven't logged in during the last three months. If you use the paid version, your account is never deleted automatically. If you wish to delete it anyway, just send us a mail about it. (Q) How long time do I have to make my move? (A) Normally 24 hours from the time it's your turn but from v1.24 (paid version) the creator of the fight can select other times too. 36 and 48 for example. From v1.28, Speedfights with roundtimes as short as 5 minutes can be started too. (Q) What happens if I don't make my move in time? (A) Well, pick opponents that you know play fast or buy the app to be able to create fights with as short roundtimes as 5 minutes. (Q) Where does an excluded player's tiles go? (Q) What determines the order of players in a fight? (Q) How many Jokers are there in each fight? (Q) Usage of the Joker is not according to RummiKub rules? (Q) How is the score divided between players? (Q) What is a hoarder? (Q) How can I send a "gift" to an opponent? (A) Inside a fight you can send "gifts" to any opponent. You can send love, throw an egg, light up fireworks, etc. You can access this by long-clicking on your opponent's name at the top. (Q) How can I make the FastForward to go faster? (Q) What are Ranking Points and how are they calculated? (Q) What are the ranking titles? (Q) How often are fights started on the server etc? (A) Every 15'th seconds the server schedules, creates, starts or ends fights. It also checks for player exclusions every 15th seconds. Every 60 seconds it recalculates statistics, updates rankings and sends out notification messages to players. (Q) How can I block someone from starting fights against me? (A) Since v1.31 of RummyFight you can block players using both the app and this homepage. You can do that from any Profile Dialog so either you click on the player's name in an existing fight or you search for the player in the NewFight-section of the app and long click on the result. (Q) What does all these numbers and texts in the Lobby mean? (Q) How do I start a new fight? (Q) How do I play against my friends? (Q) How do I play a four player fight where two opponents are my friends and one can be anyone? (Q) How can I leave a fight? (Q) How often does the Lobby refresh? (A) If you are running the Free version, the Lobby refreshes every 90 seconds. If you are running the Paid version, the Lobby refreshes when it needs. (Q) What is "Instant Update"? (A) It's a feature where the Lobby and the fights refresh themselves automatically immediately after your opponents' have made their melds. (Q) Why is there no refresh button in the Lobby? (A) Since v1.32 you can press the R in RummyFight for a Refresh of the Lobby. You can only do it every 15 seconds though. However you shouldn't need to push Refresh at all since the Lobby refreshes itself when something has happened. (Q) What Notifications are sent to my device? (A) "You are invited to a fight", "It's your turn", "Hurry up", "You have a new chat message"
(Q) How do you send Notifications to my device? (Q) Why are there ads in the Free version? (Q) How can I change my password if I have forgotten my old one? (A) Request a new temporary password using the "forgot your password"-link in the app or on this website, then use that one to login. Don't forget to change the password to something you will remember then. (Q) What Android versions are supported? (Q) What iOS versions are supported? 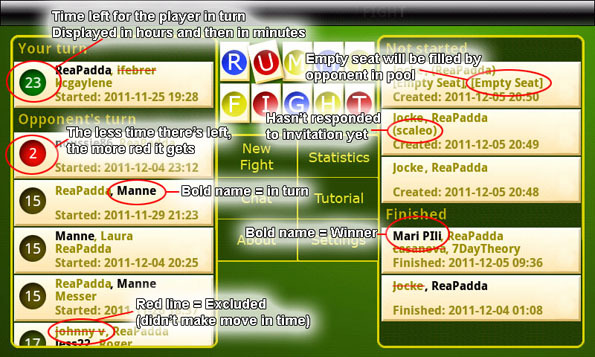 (Q) Does RummyFight work on an Android tablet? (Q) Does RummyFight work on an iPad? (A) Yes... Since v1.60 RummyFight is an Universal app meaning it works on most iOS devices. (Q) I've purchased the Paid Android version but I still seem to be running the Free. Howcome? (A) That's because you now have them both running on your phone at the same time, making the server confused. Please uninstall them both and reinstall the paid version again. Don't worry, you will not have to pay again and all your fights will still exist since they are stored on the server, not on your phone. (Q) My app has crashed. What can I do? (A) Make sure you send an error report. You will get that option when the app dies. This way, we developers will get information about WHY the app crashed and can implement a solution to be released. The source code of RummyFight is at the moment almost one million characters so it's impossible for us to guess where the error is. (Q) Why am I having trouble connecting to the server in some fights? (A) If you are connected to the Internet using a WiFi-connection, make sure your firewall is not blocking port 80 and 443. Try using the mobile connection instead to see if it works better. Then you know. And most importantly: Make sure you ALWAYS are using the very latest release of RummyFight. There's a reason we do release updates. You can see your current version in the app's About section.